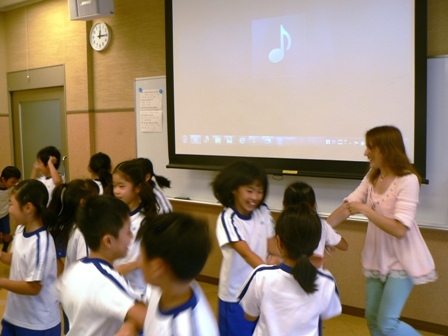 Today I would like to write about my visit to Bunkyo Elementary School on October 27th. My audience was composed of 40 3rd graders who entered the room still very energetic from their gym education class. Taking advantage of that energy I first started by introducing France generally, first talking about basic topics (geography, flag, currency, president etc). What do we wear in school? The first funny reaction (followed by big “eeeehhh” of surprise) came when I told them people in France kiss on the cheeks to greet in the morning or when meeting. Even between boys and girls (and more cries of surprise there)! I then showed them pictures of my birthplace, a small countryside town called Cestas, next to Bordeaux in the southwest of France, and pictures of my family as well. 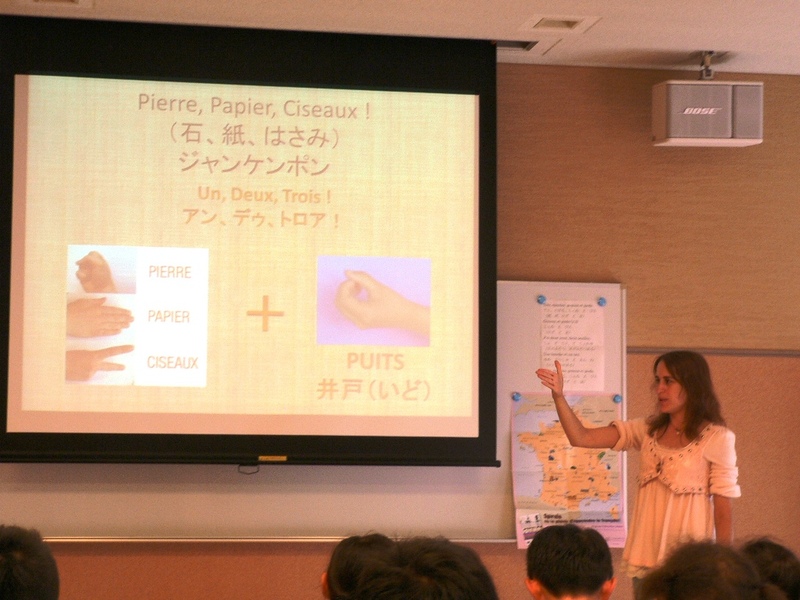 I then talked about school life in France’s elementary schools. 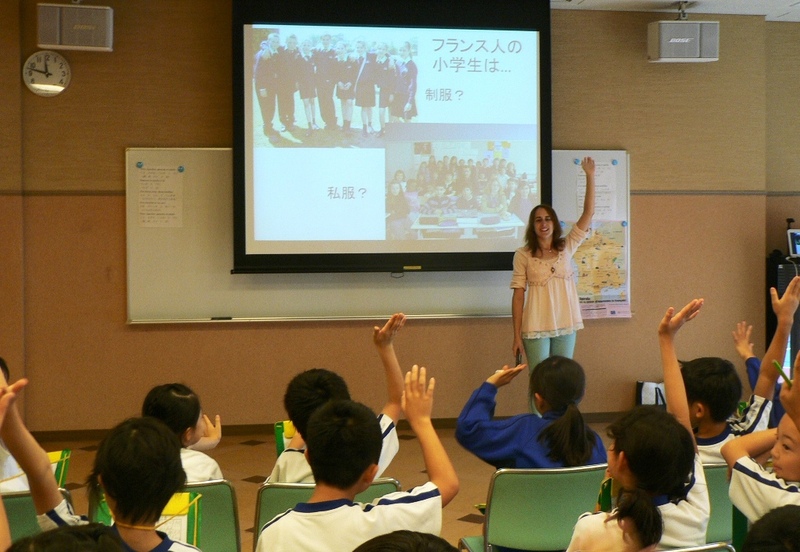 They were pretty surprised to know we don’t clean the school (staff do it usually), that we have a 2 hour break for lunch and that we organize a carnival at school instead of “gakusai” school festivals in Japan. They were so into the topic that they kept asking questions during the presentation, and I was more than happy to answer their eagerness to know! To end the presentation, I told them about a few cultural habits such as crepe day (chandeleur) on February 2nd, Easter or the little mouse (that comes at night and takes your tooth, leaving you a coin instead). After the presentation, it was time to dance! They had previously learned the song “head, shoulders, knees and toes” in English so I taught them the song in French as well. We also danced to a really famous song called “La danse des canards” (the duck dance). It’s a bit of an old song but it’s still widely used during year-end parties, weddings and other big events to get groups of people to have fun together and break the ice as well. 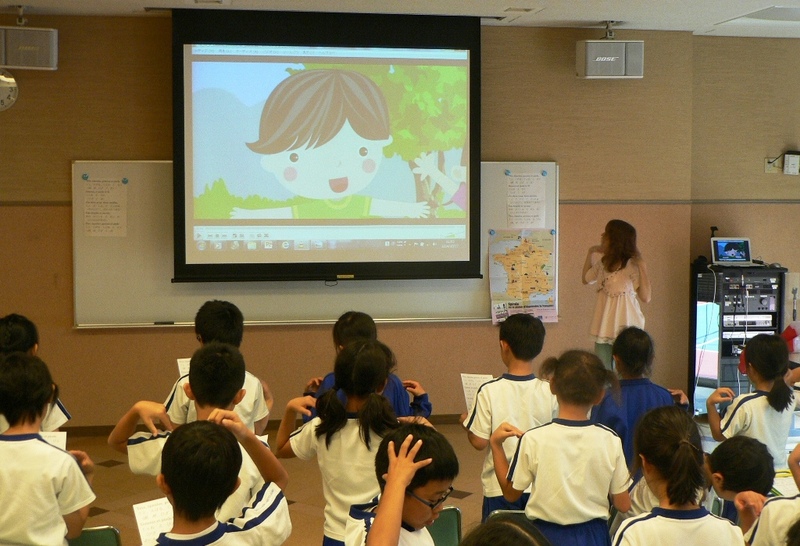 After learning the choreography, children happily danced along with the song and it was hard to stop them at the end. We took a group picture before leaving, and many children wanted to shake hands as if I was a super star. Some even said they would not wash their hands anymore! It was so cute. The children were so eager to learn about France and foreign countries that I spent the best time ever as well teaching them as much as I could. I hope to be back again! This entry was posted in International Lecture 国際理解講座, Kyoto Prefectural Center - 京都府国際センター and tagged フランス, Bunkyo Elementary School, France, Kids キッズ, Kyoto Prefectural International Center, 国際理解講座, 国際教育, 小学校, 文教小学校, 京都府国際センター by tabunkakyoto. Bookmark the permalink.